An unusually difficult model to find and offered here on The Attic for the very first time. Fairbanks-Morse, a small Indiana based manufacturer, was known for their engineering advancements and a fine array of radios. Their colorful dials are simply alluring, as you can see in the pictures. The cabinet has been refinished using the very finest toning and finishing lacquers, producing a gorgeous luster, paying homage to the original detailed finish. The set retains its original knobs and grille cloth. 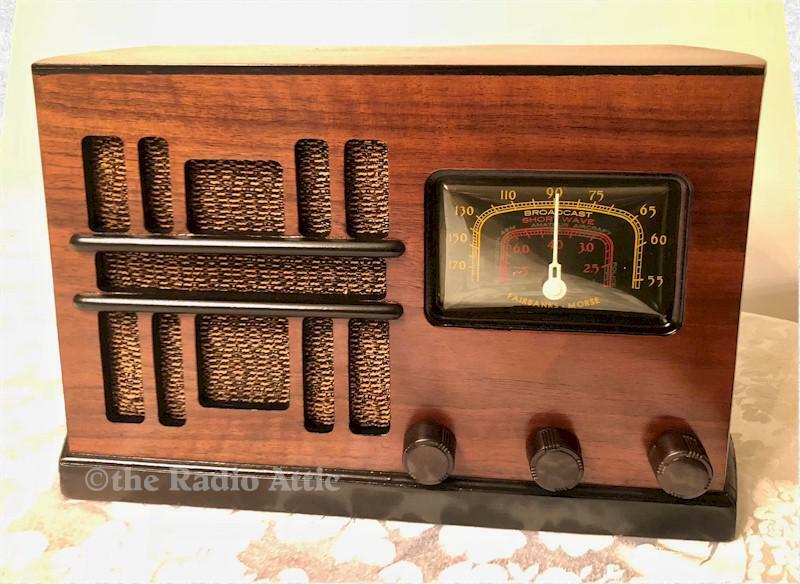 The electronics have been completely restored (no shortcut repairs, internally fused for your safety and has a new polarized power cord), and it plays very nicely on both the AM and shortwave bands. I have added an MP3 input so you may listen to your own supplied music if you wish. Benny Goodman and the Andrew Sisters sure sound nice on this radio. 14"W x 9"H x 7"D.